She lives in an extended family; there are eight members: her parents, five siblings, and her. Her father is the breadwinner of the family. He is a construction worker. He does not earn much, which makes it difficult for him to fully support everyone. Having seen the difficulties, we decided to enroll her in our sponsorship program. When she was five years old, she was hospitalized because of pneumonia. Under careful treatment, she recovered. 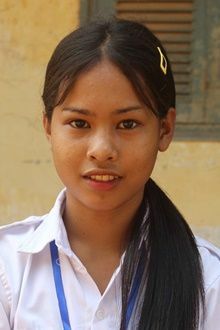 She actually started school three years later than normal school age as she moved from Stueng Treng where she lived with her grandmother to Kam??? Sreyno was selected into our project because her family is very poor. She lives in a small house, while her family's economics is bad. Tell your friends Sreyno needs a sponsor!